Lil' Bug has lots of dots, and lots of bugs too. Little bees, dragonflies, caterpillars, and ladybugs dot this cute style, along with multi-colored dots of all sizes. The chunky, hand lettered font doesn't stand still, either; it bounces up and down like a line of little kids who are waiting for roll call to be over. Altogether, a style that's full of fun! Available in many bright colors for a party for your special person. 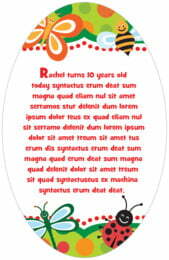 Customize your Lil' Bug text labels today!